When I woke up on November 18, 2017, I knew it was going to be a great day regardless of the 40 mile per hour winds, or the frigid temperatures. I had a feeling that despite the unfortunate weather, my bride and groom would be ecstatic because this was the day they would become husband and wife. 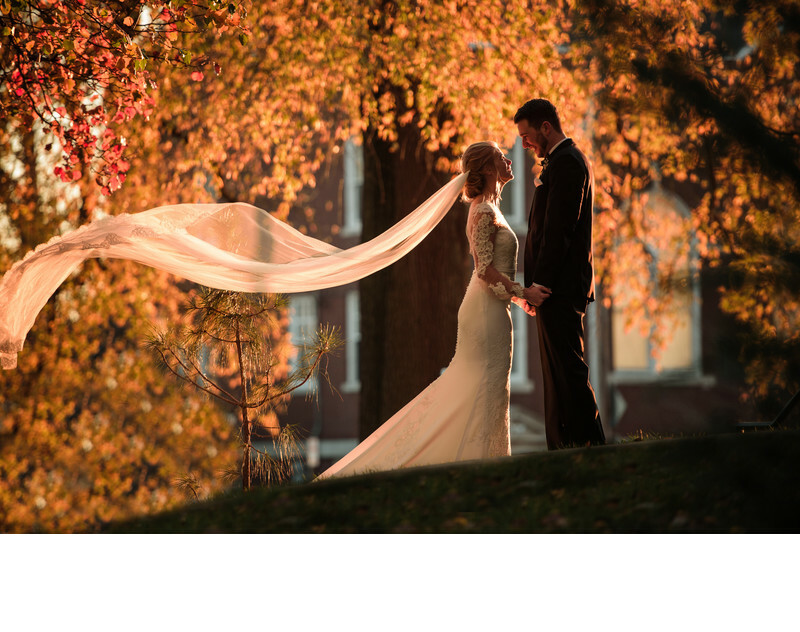 The November weather took a turn for the best right after the ceremony. I took a peak outside and the sun was shining as if it were mid-day. It was still chilly, but the wind had subsided and I sensed we were about to make some beautiful wedding portraits at Drury Stone Chapel. This bride had a french silk veil which photographs differently than the typical veil. It flowed in the slight wind so naturally. I love the rim light on her face as she is looking into her groom's eyes. The fall color in the trees is lit by the sun and it is as if the leaves are encircling this happy couple. Diamonds and Dos perfected her bridal hair which gave her such a classic look. I love the colors in this portrait and the natural love between this couple.